FRITZ HANSBERG is a privately owned company based in Modena, Italy. Our specialty is the design and manufacture of core making and green sand molding equipment. During 50 years of activity in the foundry industry, FRITZ HANSBERG has steadily developed and consolidated the technical excellence that has been the hallmark of the Company since its very first days, when the German engineer and foundryman, Fritz Hansberg, designed and patented the first Coreshooter (1949). 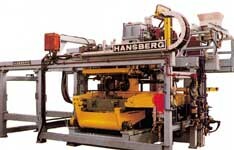 Entirely controlled and managed by the Hansberg family, FRITZ HANSBERG currently employs about 50 people. All activities are concentrated on one single site in Modena covering 20,000 m2 of which over 6,000 m2 of office and production buildings. The latest CAD/CAM technology and NC machining centers are employed in the design and manufacture of our equipment. in small to medium series.